We are a leading Manufacturer of dcc laser hair growth helmet from Delhi, India. 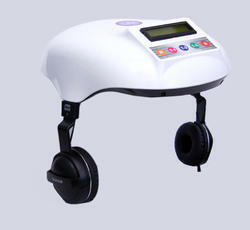 DR CURE AND CARE LASER HAIR GROWTH HELMET for hair restoration. Uses LLLT FDA approved technology. Use 10 to 25 minutes for thrice in a week. And get fuller and thicker hair. Man and women both can use. Looking for HAIR REGROWTH HELMET ?